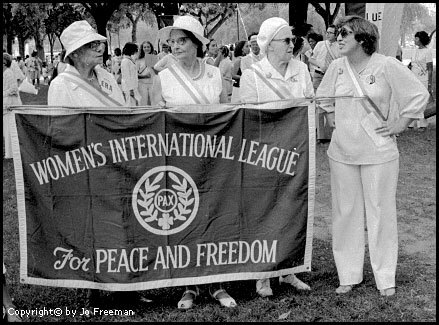 The Women's International League for Peace and Freedom was founded in 1915 during World War I, with Jane Addams as its first president. WILPF works to achieve through peaceful means world disarmament, full rights for women, racial and economic justice, an end to all forms of violence, and to establish those political, social, and psychological conditions which can assure peace, freedom, and justice for all. WILPF works to create an environment of political, economic, social and psychological freedom for all members of the human community, so that true peace can be enjoyed by all. On April 28, 1915, a unique group of women met in an International Congress in The Hague, Netherlands to protest against World War I, then raging in Europe, to suggest ways to end it and to prevent war in the future. The organizers of the Congress were prominent women in the International Suffrage Alliance, who saw the connection between their struggle for equal rights and the struggle for peace. WILPF's foremothers rejected the theory that war was inevitable and defied all obstacles to their plan to meet together in wartime. They assembled more than 1,000 women from warring and neutral nations to work out a plan to end WWI and lay the basis for a permanent peace. Out of this meeting the Women's International League for Peace and Freedom was born. WILPF's first International President was Jane Addams, founder of Hull House in Chicago and the first U.S. woman to win the Nobel Peace Prize. For more information about Jane Addams, visit the official site of the Nobel Foundation. It was the wisdom of our founding foremothers in 1915 that peace is not rooted only in treaties between great powers or a turning away of weapons alone, but can only flourish when it is also planted in the soil of justice, freedom, non-violence, opportunity and equality for all. They understood, and WILPF still organizes in the understanding, that all the problems that lead countries to domestic and international violence are all connected and all need to be solved in order to achieve sustainable peace. Founded in 1915, the Women's International League for Peace and Freedom (WILPF) is the oldest women's peace organization in the world. It is a non-profit non-governmental organization working "to bring together women of different political views and philosophical and religious backgrounds determined to study and make known the causes of war and work for a permanent peace" and to unite women worldwide who oppose oppression and exploitation. WILPF has National Sections in 37 countries. WILPF is headquartered in Geneva, Switzerland and maintains a United Nations Office in New York City. The forerunner to WILPF, the Woman's Peace Party (WPP) was formed in January, 1915 in Washington, D.C. at a meeting called by Jane Addams and Carrie Chapman Catt. The approximately 3,000 women attendees approved a platform calling for the extension of suffrage to women and for a conference of neutral countries to offer continuous mediation as a way of ending war. WPP sent representatives to an International Women's Congress for Peace and Freedom, held in The Hague from April 28 to April 30, 1915. The Congress was organized by the German feminist Anita Augspurg (1857–1943), Germany's first female jurist, and Lida Gustava Heymann (1868–1943) at the invitation of the Dutch pacifist, feminist and suffragist Aletta Jacobs to protest against the war then raging in Europe, and to suggest ways to prevent war in the future. The Congress, attended by 1,136 participants from both neutral and belligerent nations, adopted much of the platform of WPP and established an International Committee of Women for Permanent Peace (ICWPP) with Jane Addams as president. WPP soon became of US Section of ICWPP. Jane Addams met with President Woodrow Wilson and is said to have worked out some common ground on peace. However, at their 2nd international congress, held in Zürich in 1919, ICWPP denounced the final terms of the peace treaty ending World War I as a scheme of revenge of the victors over the vanquished that would sow the seeds of another world war. They decided to make their committee permanent and renamed it the Women's International League for Peace and Freedom. WILPF moved its headquarters to Geneva to be near the proposed site of the League of Nations, although WILPF did not endorse empowering that organization to conduct food blockades or to use military pressure to enforce its resolutions. Two WILPF leaders have received the Nobel Peace Prize for their peace efforts and international outlook and work with WILPF: Jane Addams, in 1931 and Emily Greene Balch in 1946. Against the background of the bloody Great War then raging in Europe, Jane Addams and Carrie Chapman Carr summoned together a conference of 3000 women in Washington, D.C. to call for peace, the limitation of armaments, nationalization of weapons manufacture, opposition to militarism in culture and government, and economic sources of conflict. Jane Addams served as the first chairman of the new Woman's Peace Party. Representatives of the WPP participated in the International Congress of Women in April 1915 held in The Hague. Addams chaired the Hague Congress and oversaw the creation of an International Committee of Women for Permanent Peace (ICWPP). The WPP would become the U.S. Section of the ICWPP at the latter organization's first annual meeting in January 1916. The Second International Congress of Women was held in May 1919 in Zurich, Switzerland as the great powers met to determine the final terms of peace in Paris. The ICW was critical of the sanctions regime of the Versailles Treaty and sought universal free trade, arms reductions with parity for all powers, and a world league that represented all people. The delegates decided to form a more permanent organization and the ICWPP became the Women's International League for Peace and Freedom (WILPF). The new organization chose Jane Addams as its international president and Emily Green Balch as secretary-treasurer to run its new headquarters in Geneva, Switzerland. The U.S. Section of WILPF was headquartered in New York City and later Washington, D.C. in November 1921. By 1924, the U.S. Section had 26 branches with a membership of 6,000. State and local branches varied in overall membership and level of activity, but most groups promoted "methods for the attainment of that peace between nations which is based on justice and good will and to cooperate with women from other countries who are working for the same ends." WILPF requested that the United States Government release political prisoners and conscientious objectors in January 1920. The group was an early advocate of U.S. recognition of the Bolshevik government in Russia. WILPF was an active proponent of efforts to outlaw war as it strongly supported the Kellogg-Briand Pact of August 1928. The emergence of fascism in the 1930s would prove more divisive to the organization as some members sought collective security while a majority continued to pursue complete neutrality.